Learning any art is better for your self-defense than learning no art. Even cardio kickboxing, which is not intended for self-defense or sport combat, has something to offer: coordination for striking, strength training, and the mindset that yes, you can actually punch pretty hard if you just try. That’s right – if you want to learn how to defend yourself, you have to learn how to attack. 3b) but, more likely, you aren’t. So you do something drastic. Break their elbow or knee. Kick their groin as hard as you can with your toes. Stab your thumbs into their eyes. If they’re holding you, hit them again, and again, and again until they let go and don’t grab again. Then, once they can’t chase you (or at least, not as fast), you run. That’s your defense. 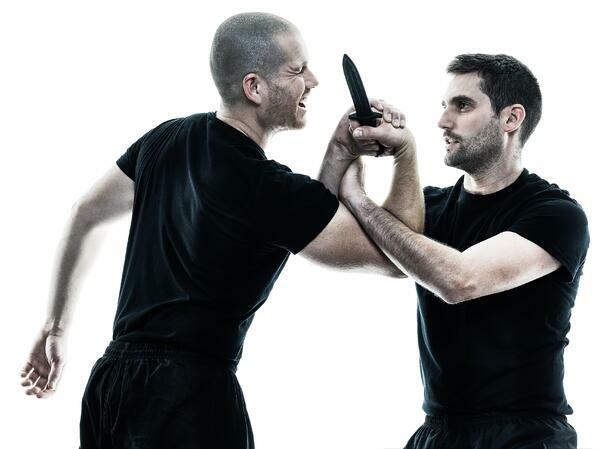 Krav maga may be the most recognizable martial art form on this list. It was created for military use, but has long been adapted and brought into the civilian world (where it is no less effective). Its founder, Imi Lichenfeld, studied boxing and wrestling as a young man, and krav draws inspiration from those arts. However, the true roots of krav are the fights Lichtenfeld got into as a young Jewish man countering anti-Semitic gangs in Slovakia in the 1930’s. Krav maga is both simple and effective. This is exactly the combination you want out of a true combat martial art. If you’re attacked on the street, you want to be able to react quickly and effectively without having to think through any flowery forms or techniques. Its focus on knife and gun disarms make it particularly useful for those looking to defend themselves against modern, armed would-be assailants. Read more about krav maga here! The Filipino martial arts styles evolved out of necessity. The early people of the Filipino Islands often had to defend themselves against invaders, and developed fighting styles that could be used with relatively common objects such as sticks and knives. The focus on these two weapons emphasizes the simplicity and utility of the style. There is less of an emphasis on ground game in kali than some other arts, but it still has its tricks (see the video below). Knives and sticks are relatively common, and more broadly legal to carry than firearms (knives are smaller and easier to conceal, too). Despite this, if you don’t want to carry a weapon kali may not be the best choice for you. Still, it’s worth nothing that practitioners are taught to treat these weapons as extensions of their body, so many of the moves designed for the knives and sticks can be adapted to unarmed combat. Read more about kali here! Pencak silat is an early Indonesian martial art that combines multiple different forms. Like krav maga, pencak silat focuses on striking instead of grappling, which may make it more appealing to beginners. With that being said, some believe this style is in some ways less intuitive than krav maga and at times relies too much on a specific response from the attacker. This could confuse an inexperienced combatant in the chaos of a real street fight. All in all, however, pencak silat is an extremely effective style and can be applied with powerful effects. There are three primary styles of sambo: combat, sport and self-defense. As the names suggest, they have different intended uses. Sport sambo resembles judo; combat sambo was developed for the military; and self-defense sambo primarily teaches individuals how to turn an attacker’s force back against him. For self-protection, it’s recommended you take one of the latter two (preferably combat sambo, which focuses more on neutralizing, rather than just deflecting, an aggressor). This is a Russian grappling style, so once again, the learning curve is a little bit higher than striking-centric styles. You will want to make sure you have trained your technique and your reflexes specifically before using this on the street. While effective if used correctly, implementing some of these techniques incorrectly could be equally harmful to you. This list gives a quick run-through of several styles that focus on rapidly developing combat effectiveness, instead of requiring many years of disciplined training. In the end, your choice should reflect your environment and whatever you feel most comfortable implementing. This is key. If you’re not certain your body will be able to apply these techniques in a high-adrenaline, life-threatening situation, you haven’t found the right style. What art do you train for self-defense? Share your answers in the comments!